We are offering Condenser Tube Expander 1200-5 Series 3/4"- 1 1/2" O.D. Use : Highly recommended for use on thin walled tubes (19 thru 22 gage walls) of Stainless Steel, Titanium, Incolony and other exotic materials in thick tube sheets. 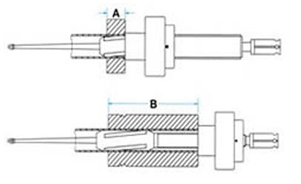 Advantages : Gives a more concentric and even expansion when expanding thin walled tubes vs. a conventional 3 roll expander and reduces tube spring back effect. Expandeers for tube sizes not listed below are also available. FROM (14.8 MM).584" TO (36.3 MM)1.43"
For best results a 'Thin Wall Thrust Coller' should be used when rolling 19 thru 22 gauge wall tubes. Model 1223-5 - 1258-5 expanders come with 3/8" square mandrel drives and Model 1263-5 - 1300-5 expanders come with 1/2" square mandrel drives.